On this blog, we often talk about topics important to CARF, like person-centered approaches, active and meaningful engagement of stakeholders, and commitment to quality improvement. These concepts usually involve integrative services and approaching a person in a holistic way. In other words, we focus on many of the things that social workers have been advocating since the era of Jane Addams in the 1890s. It is no wonder that CARF’s workforce is teeming with social work professionals. Because social work is so woven into our DNA, we happily join the National Association of Social Workers (NASW), a longtime member of CARF’s International Advisory Council, in elevating and celebrating the profession of social work during Social Work Month. NASW is the largest membership organization of professional social workers in the world and has been involved with CARF standards development for 20 years. We spoke with a few CARF staff members, surveyors, and advocates to help spread the message of what social work means and how it relates to their work with CARF. “Although my role at CARF is Managing Director for Aging Services, I know social workers interact with older adults and their family caregivers across all of CARF’s customer service units, not only through the constellation of aging programs. Their activities span from leadership and administrative roles to providing clinical support and guidance. They are advocates and change agents, and they spearhead research initiatives. Sandra Kohtz, LCSW, CARF Surveyor – Consultant, Harmony Foundation, Inc.
“My role as a resource specialist is to provide technical assistance regarding CARF standards and the accreditation process. Being a resource specialist fits nicely with my desire to practice social work at a macro level. “As a macro-practice social worker, I am prepared with the knowledge, skill, and practice in the area of program planning and evaluation, administration, policy and advocacy, and community practice. Macro-practice social workers empower at a level that affects systematic change. 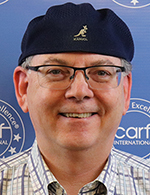 As an organization prepares for CARF accreditation, it implements standards to elevate its business and service delivery practices, which include person-centered care, stakeholder engagement, and a commitment to quality improvement. CARF thanks all social workers for your efforts to ensure a holistic and inclusive service experience for all persons in the community.